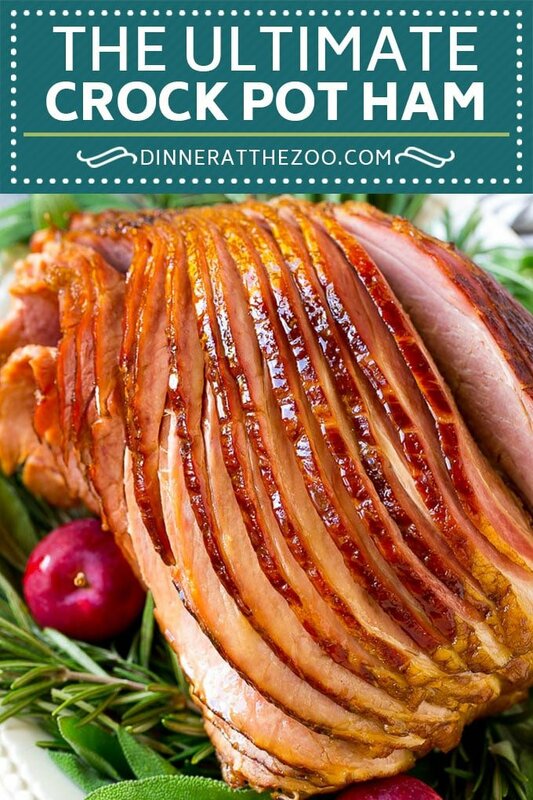 This crock pot ham is a spiral cut ham topped with a 3 ingredient glaze, then slow cooked to perfection. 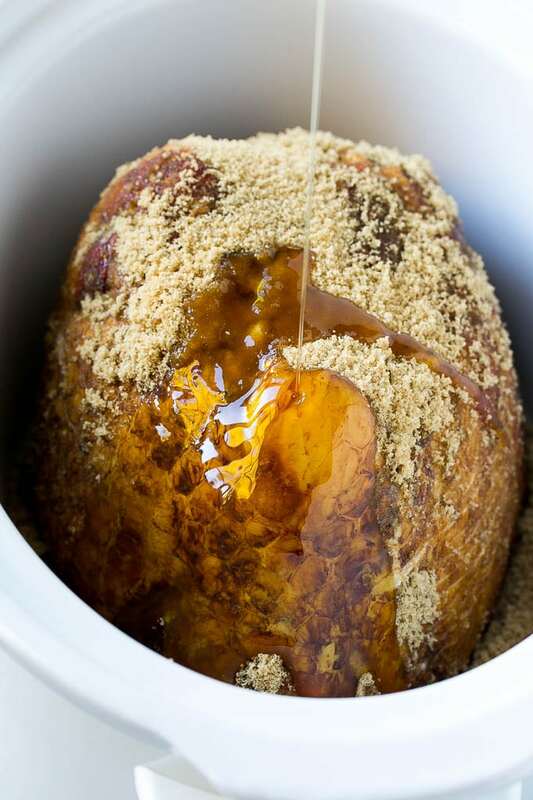 This is the BEST way to make your holiday ham, the slow cooker does all of the work! 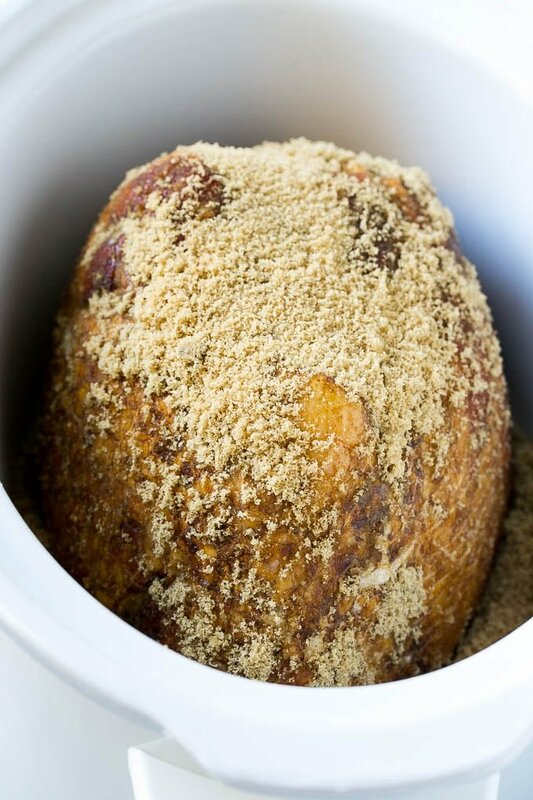 I’m always looking for ways to make holiday entertaining easier, and this crock pot ham is about as simple as it gets. All it takes is 5 minutes of prep time, and you end up with the most tender and succulent ham of all time! Not a ham fan? 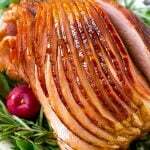 Try my herb roasted turkey or slow cooker turkey breast instead. Whenever there’s a holiday, there’s a ham on my table. I love to cook ham because most of the work is done for you before you even open the package. 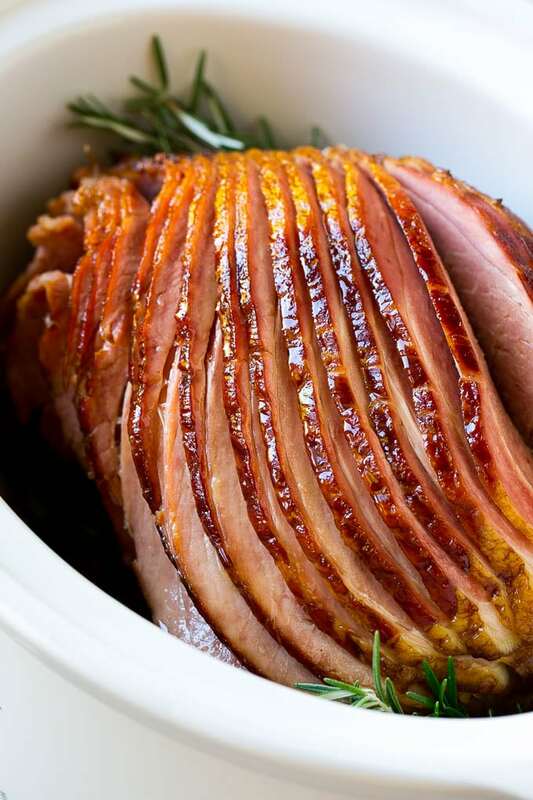 All you need is a delicious glaze and a slow cooker to make this simple crock pot ham. Best of all, it frees up oven space so that you have plenty of room to cook up your sides and desserts. How do you make crock pot ham? The first step is to choose your ham. I always go with a smoked spiral cut ham. You’ll want a ham around 7-8 pounds in size. If you go any larger, you may have trouble fitting it into your crock pot. You can always trim off the end to make it fit if needed. The ham is coated in brown sugar, then doused in maple syrup and pineapple juice to form a sweet glaze that simmers away along with the ham. You’ll need a large oval slow cooker for this recipe – the one shown here is an 8 quart slow cooker, I’ve also used my 7 quart size with success. The glaze is fairly thin when it comes out of the crock pot, so I like to transfer it to a pan on the stove top and simmer the glaze until it thickens. Not a fan of pineapple juice? Try apple cider instead. I like to garnish my ham platter with an assortment of herbs and fruit for a beautiful presentation. How much ham per person? You’ll need about 3/4 pound of ham per person for a bone-in ham. 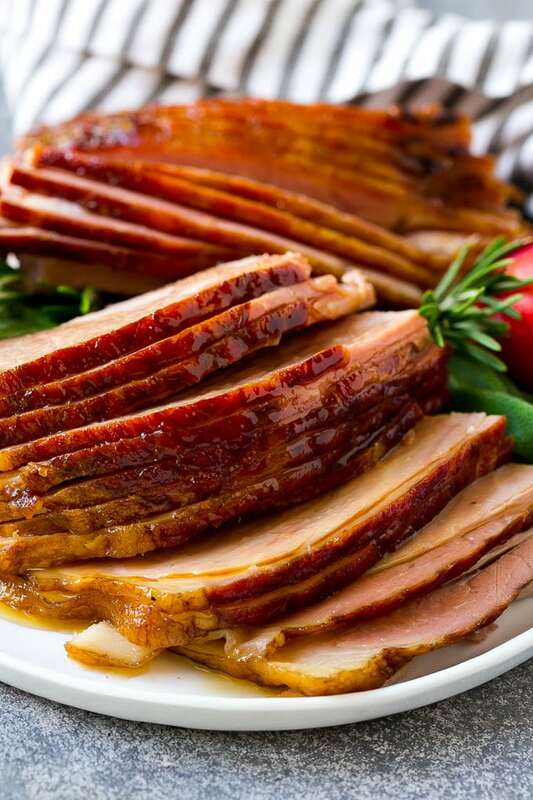 If you want plenty of leftovers, you can increase that amount to 1 pound of ham per person. How long to cook a ham? It takes approximately 3-4 hours to cook a ham in the crock pot on low heat. 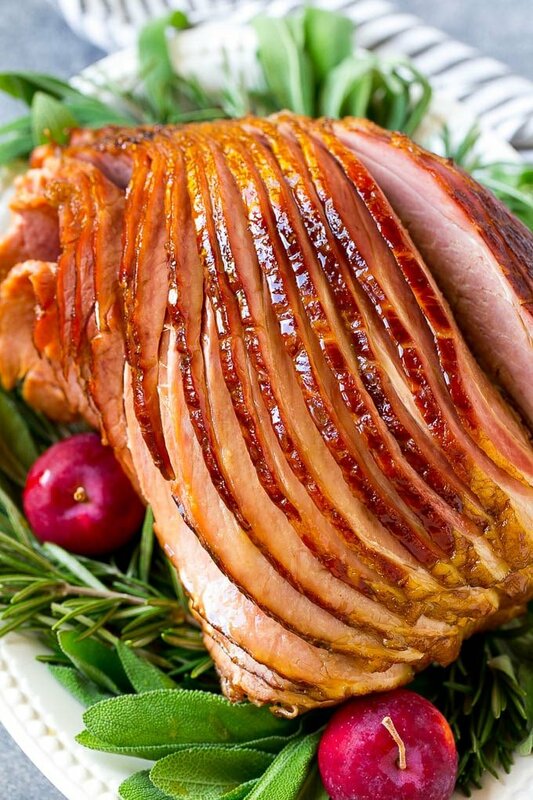 You can check to make sure your ham is heated through by inserting a thermometer into the thickest part of the ham. The thermometer should read at least 140 degrees F.
Ham pairs perfectly with potatoes, vegetables, cornbread, or even stuffing! Here are some of my favorite holiday side dishes that I serve alongside my crock pot ham. One of the best parts about a holiday meal is enjoying the leftovers the next day! You can reheat your ham by covering it with foil and warming it in a 275 degree oven. Got leftover ham? 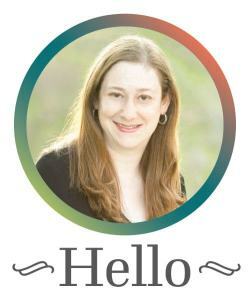 I’ve got plenty of ways for you to repurpose it! Check out my list of 40 Satisfying Leftover Ham Recipes. 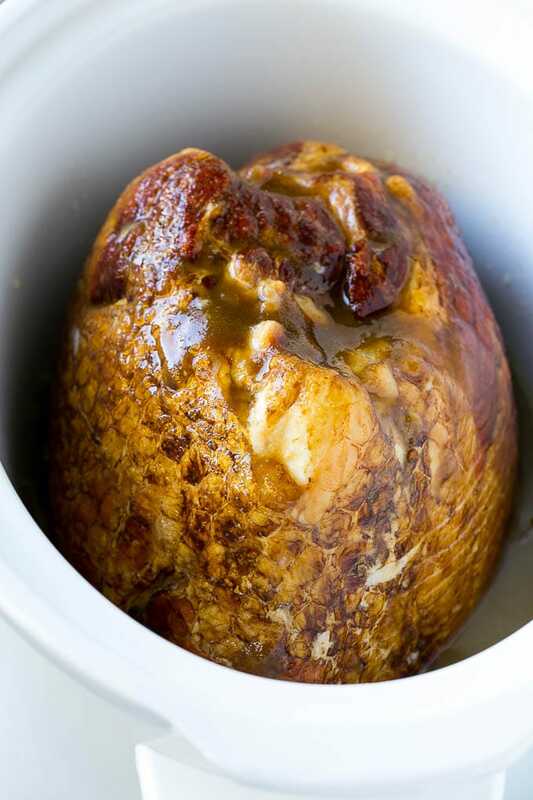 I love this crock pot ham because it’s tender, flavorful and so incredibly easy to make. It’s a huge hit every time I serve it! Coat a large 7-8 quart crock pot with cooking spray. Place the ham cut side down in the crock pot. Rub the brown sugar all over the ham, then pour the maple syrup and pineapple juice over the top. Cook for 3-4 hours on low heat, or until a thermometer registers 140 degrees F when inserted into the thickest part of the ham. Transfer the ham to a serving platter. Pour the liquid from the bottom of the crock pot into a medium sized pan. Place the pan over medium-high heat and bring the liquid to a simmer. Pour the sauce over the ham. Decorate the serving platter with fresh herbs if desired, then serve. If you prefer a thicker glaze, you can whisk together 1 tablespoon of corn starch with 2 tablespoons of cold water and add it to the sauce pan when you simmer your liquid from the bottom of the crock pot. Does it have to be a spiral ham or can I just cut slits into a regular and still cook it this way? Could you just use the packet of glaze that comes with the ham? Yes you can do that if you prefer! Does it have to be a spiral ham or can I just put slits in a regular ham and still follow the recipe? If I am doing a 4lb ham, do I cut everything in half , including the cooking time? Thank you. It’s fine to cut the glaze in half, I’d cook for 2-3 hours on low. Does it have to be a ham with the bone in or can it be a boneless ham?